Exclusive First Read (And Listen! ): B.J. Novak's 'One More Thing' The Office writer B.J. Novak expands his scope from Dunder Mifflin to the range of human experience in a new short story collection. We've got an exclusive excerpt — with readings by Novak himself, Mindy Kaling and Emma Thompson. You may recognize the name B.J. Novak from the credit sequence of The Office — he was a writer and executive producer. 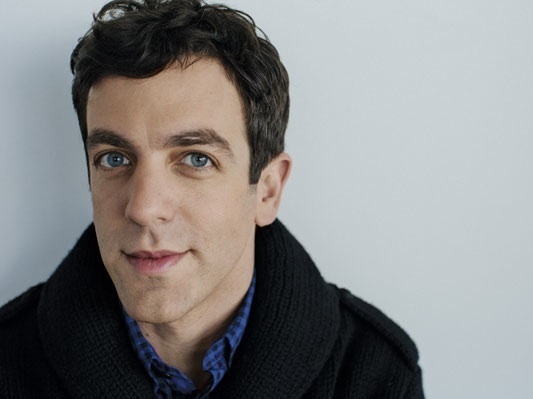 He also played the entertainingly amoral Ryan Howard. Now, Novak is expanding his scope beyond the walls of Dunder Mifflin and taking on a range of human experience in this quirky new story collection, which ranges from linked vignettes to two-line miniplays about carrot cake. In the stories excerpted here, a red T-shirt plays a significant role in a chance meeting — and a literalist declares his love. We're also taking inspiration from our friends over at NPR Music with a First Listen: Scroll down for readings done by Novak, Mindy Kaling and Emma Thompson. One More Thing: Stories and Other Stories will be published Feb. 4. I wear a bright red T-shirt every single day. That's all you have to do to meet the girl of your dreams. It sounds easy, doesn't it? It is. That's exactly my point. Wearing a red T-shirt is the hardest part of it all, and it's as easy as could be. Once I have the red T-shirt on, I just live my life, exactly the way I want to live it. Maybe I take my dog for a walk in the park. If there's a new bar or restaurant I've heard about, I might go and check that place out, and if there are any friends I want to catch up with, I might grab a bite or a drink there with them. But there's also nothing wrong with going to a restaurant or bar by yourself — in some ways, that's even better. I wear one with a pocket, but it doesn't matter. Bright red is the thing. Then when you're done living your life for the day, you just go to this website called Missed Connections and type in red shirt. Don't put it in quotes, because some people might say "red T shirt" without a hyphen, and some others might spell it t-e-e or some other little variation. There's no one right way to spell "T- shirt." Isn't that interesting? So anyway, just type red shirt. It will take a little bit of extra time, but that way you'll be sure not to miss anything. B.J. Novak is a writer and actor best known for his work on NBC's Emmy Award-winning comedy series The Office. One More Thing: Stories and Other Stories is his first collection. Then you get to see who liked you. More important: who liked you for you. Not you changing your behavior to impress anyone or please anyone. Not you on "date behavior." Just you being you. And anyone will tell you that's the whole point. You want to meet someone who likes the same things you do, and who likes you most when you're most being yourself, so that when you are in a relationship, the person will truly be compatible with the real you. Now: when someone does contact you, and it seems like it might be a match, should you wear another shirt on the date besides the red T-shirt, so it doesn't seem like you only have one shirt? Or should you wear the red T-shirt as always, in case the first date doesn't go well and you want a simple way to check if you caught anyone else's interest while you were out on the date? That is a very interesting question, and one that I think about a lot. I will let you know what I do when that comes up. I was outside the Trader Joe's at 21st and 6th at around 2:30 pm last Wednesday. I was wearing oversized sunglasses and a small straw fedora hat, light blue jeans, a black t- shirt- like top, and had freshly washed shoulder- length dirty blond hair with bangs. I'm 29 but people sometimes guess I'm anywhere from 28 to 30. I was carrying two paper grocery bags. You were walking by me in the opposite direction, carrying groceries, too, but only one bag. You asked if you could help and when I tried to explain that then your hands would be just as full as mine, I dropped a bottle of salsa, red, medium spicy Trader Joe's brand (or Trader Jose's, as you corrected me) but it didn't shatter which we both found interesting. I told you my name was Lila (L-I-L-A) and you told me you had a cousin who pronounced it the same way but spelled it differently (L-E-I-L-A). It turned out we were both from the same area code in New Jersey (551) and we talked about our hometowns for a bit and that diner where everyone used to go after games in high school. Then you walked me home carrying one of my two bags even though I said it made no sense to, and you insisted on bringing them all the way inside for me, and then I made a pot of coffee even though I was only making one cup for you, and then you explained about French presses and Kerrig (sp?) machines. Then we both looked at the clock at the same time and realized we had somehow been talking about coffee for over an hour! You looked in my eyes and said it felt like we had somehow known each other for a long time and I said "I agree" and then we made out on my green quilted couch with a blue stain on the left armrest, and after our very first kiss you pulled away from me and caught your breath and just said the word "electric." Then you kissed me again and we made out until we both looked at the clock at the same time again and realized we had been making out for three hours. Then we watched Iron Chef together and then Planet Earth, the African plains episode, and we both agreed how that was totally the jackpot Planet Earth, because so many are about jellyfish or algae but all anyone wants to really see are giraffes & monkeys & elephants, etc. I said I didn't want you to leave and you said "me neither" and you slept over at my place in borrowed navy blue pajamas w/ yellow stripes and a hole in the left knee from when my brother visited me and we both said we weren't cuddlers but we cuddled anyway for almost an hour, and then finally you slept on the left side of the bed which was perfect b/c I sleep on the right. I slept on my back which you said was pretentious and I said "what do you mean? That's just how I sleep! How can it be pretentious?" and you said "like you think you're a beautiful angel or something" and I said "maybe you're just really into me" and we kissed again. Then you turned to sleep on your stomach w/ your head facing left and I said "doesn't that hurt your neck?" and you said for some reason usually not, but sometimes yes, and that your fantasy when you were a kid was to get a bed with a hollowed out hole straight down from the pillow so you could sleep with your head face down and straight and I said, "Like a massage chair?" and it turned out you had never had a massage, so I said let's go this weekend so you could check out if that was similar to what you had been thinking of as a kid, and if it's how you want to sleep, it'd be weird, but hey, it's your life, and you laughed and said "deal" twice. "Deal. Deal." Like that. Then you realized your phone (a Motorola) had died and I didn't have the right charger, and you said that's probably a sign that you should get going anyway and take care of some stuff at home, and I said cool, and then we made a plan that you'd come over on Friday and I'd have to cook a dinner that included every single ingredient that I had in those Trader Joe's bags, Iron Chef style. But then the next day, you didn't come over or call to explain why, or reschedule it. I know that I gave you my number but now I realize that sometimes I write numbers in a scribble, especially when I'm excited, which I was, so maybe you haven't been able to decode it or left a message for the wrong number. I know this sounds crazy to say after one encounter but I kind of fell for you pretty hard & it has been forever since I've connected to anyone like this & my heart is kind of broken in a million pieces. Hit me up if you think anything in this description matches anything you remember, and if so, maybe we can chill sometime? You were wearing a red t- shirt with a pocket. 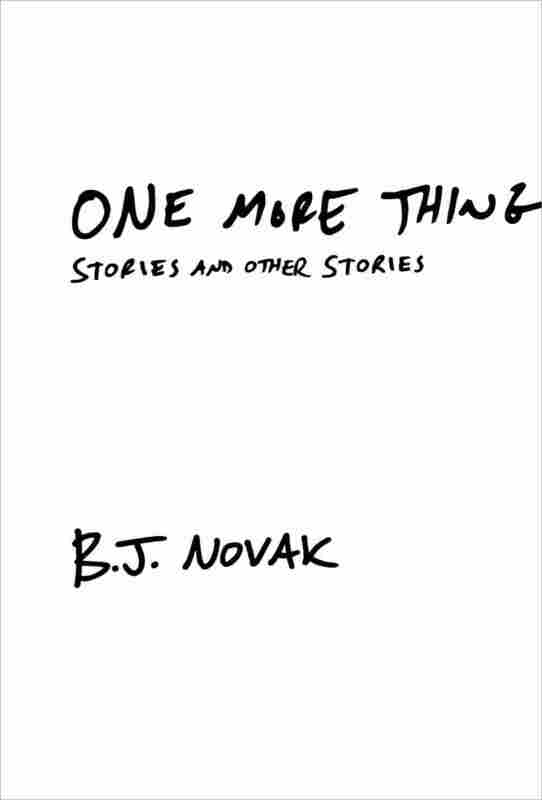 Text and audio excerpted from One More Thing: Stories and Other Stories by B.J. Novak. Copyright 2014 by B.J. Novak. Audio production copyright 2014 by Random House LLC. Excerpted by permission of Penguin Random House Audio Publishing Group and The Knopf Doubleday Publishing Group, divisions of Random House LLC. All rights reserved. No part of this excerpt may be reproduced or reprinted without permission in writing from the publisher.